New Orleans Declares Sazerac Its Cocktail of Choice The Louisiana Legislature has proclaimed the Sazerac — a potent mix of rye whiskey, bitters and absinthe — New Orleans' official cocktail. A local bar chef explains the appeal and shares the secret to making the iconic drink. The Louisiana House of Representatives made a historic decision Monday: In a 62-33 vote, legislators proclaimed the Sazerac — the famed mix of rye whiskey, bitters and absinthe that originated in the bayou — New Orleans' official cocktail. NPR's Robert Siegel prepares a Sazerac under the strict guidance of Lu Brow, bar chef at the Swizzle Stick Bar in downtown New Orleans. Brow calls the Sazerac a "wonderful, complex" cocktail and adds, "If ever there was a city that deserved an official drink, it was New Orleans." We are Sazerac enthusiasts. Perhaps cocktails would have never caught on if the original one — the Sazerac — wasn't such a perfect concoction. 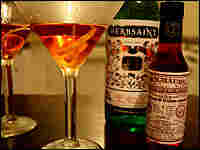 The Sazerac is easy to make but hard to master. As with all cocktails, proportion and balance are important. We've had as many bad Sazeracs as good ones — even in our beloved New Orleans. It should be reddish orange in color. To our taste, Old Overholt rye whiskey or Sazerac are balanced and preferred, and in place of the original absinthe we like Herbsaint, which is not as intense as Pernod or Pastis. We use simple syrup in place of the traditional sugar cube, which most people don't keep on hand anyway. As young girls, we were mesmerized when Leroy, the Commander's Palace bartender, held up a glass and twirled it to coat the inside with Herbsaint, the first step in making this classic cocktail. Pour the Herbsaint into a rocks glass and swirl to coat the inside. Discard any excess Herbsaint. Fill the glass with ice to chill. Combine the rye, simple syrup and Peychaud's and Angostura bitters in a cocktail shaker with ice. Cover and shake vigorously. Lindy Boggs, a dear family friend, longtime New Orleans congresswoman, and Sazerac aficionado, was the U.S. ambassador to the Vatican under President Clinton. Lindy lives on Bourbon Street in a magnificent home right in the middle of all the French Quarter action. When Lindy worked in Rome, her daughter, Cokie Roberts (famed political analyst, friend and hero of ours), quipped that it really wasn't that much of a change since her mother was used to seeing men in red dresses.